It is challenging to classify Amazon sword species for just one reason – they perfectly intersect and every day many hybrids appear. If you search for Amazon sword on Amazon.com, you will see completely different plants referred to as Amazon sword. This isn’t a big problem, since their requirements for growing conditions are more or less the same. Nevertheless, below we’ll describe classical Amazon sword appearance and tell you how to distinguish it from another popular species – Echinodorus bleheri. This Amazon sword species even has two Latin names. Its first and classical name the plant got from the name of a German plant biologist August Heinrich Rudolf Grisebach. Geographical range: the plant was discovered in Cuba. Later, in 1955 this species was found in Central America. When studying herbarium materials it was determined that expansion of this plant species is much wider, than it was considered and it looks like Echinodorus grisebachii is encountered in tropical Central and South America. Except Cuba the plant can be found in Costa Rica, Columbia, Surinam and Brazil. The plant forms a thick rosette from its long narrow bright green leaves. Large sized species are about 35-40 cm high and occupy quite large area. However, you can keep Amazon sword in a rather small tank as well. The plant grows uniformly all the year round. Sometimes the plant is mistaken for Echinodorus bleheri, since these species are closely related and the latter is also called an Amazon sword. Moreover, Echinodorus bleheri is pushing out the first plant species, since it is less demanding and looks more appealing. The difference between these two plants is quite insignificant. Echinodorus bleheri leaves are wider and their green coloring is darker, while Echinodorus amazonicus has lanceolate and a bit deflexed leaves. Echinodorus amazonicus fluffy bush looks more elegant than that of alike Echinodorus bleheri. Bent sharpened tips of the leaves make the bush especially good looking. Besides, it is in average 10 cm shorter than Echinodorus bleheri bush, which allows using it in smaller tanks and it never gets out of water. It has incredible blooming – not too dark and not too bright green, but just the right lively green color that can make any tank look natural and bright. It also looks good when thickly planted and if you put it as a single plant, the astonishing structure of the bush with ‘weeping’ tips of its leaves is clearly seen. The plant is very undemanding in terms of water hardness and its violent reaction. Amazon sword requires nutrientious and well silted up substrate. 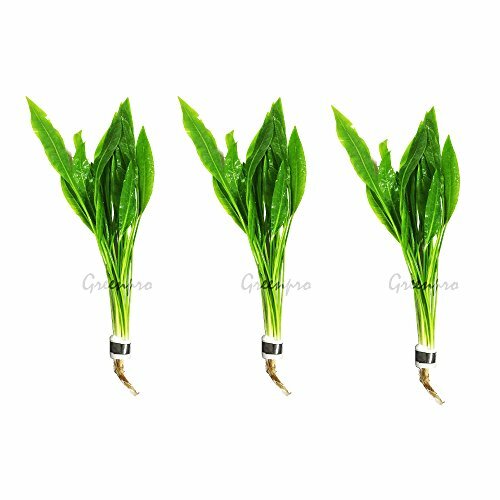 At that structure of the substrate doesn’t influence on the plant growth rate, but its thickness should be not less than 7 cm. Amazon sword can be recommended to beginner aquarists as a very enduring and undemanding plant in terms of growing conditions. It perfectly prepares the tank for more demanding plants and takes active part in cycle of matter by maintaining biological balance in the tank. 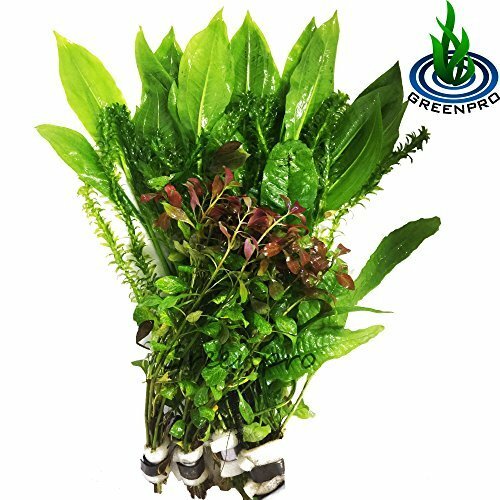 YOU ARE WINNING : 2 Bundles of Amazon Sword, 2 Bundles of Anacharis, 2 Bundles of Red Ludwigia, 1 Bunch of Java Fern. This Amazon sword species is good for any tank. Water temperature suitable for the plant may vary within 21 – 28 °С. Nevertheless, you shouldn’t keep this plant in a tank with cold water permanently. Water hardness may also vary over a wide range. Unlike most of Echinodorus species this representative of the kind successfully grows both in slightly acidic and alkaline water. It prefers fresh regularly renewed water. Amazon sword is not demanding in terms of illumination as well. It can stand long-term shadowing, but at that its leaves become paler colored. Type of illumination isn’t of high importance for the plant. It can be quite ok with having just natural light, if the tank is located near the side wall close to the window. LED or luminescence lamp will perfectly do as a source of artificial light. You can keep Amazon sword at low level of lighting, but the plant develops better at brighter illumination. Light day duration should be about 12 hours. All Amazon sword species prefer nutritious and well silted substrate. These plants have very strong root system, which requires large amount of substrate to develop effectively. That’s why thickness of the substrate where echinodorus amazonicus grows should be at least 7 cm. Type of the substrate doesn’t have significant impact on the plant growth rate. It is more important, that the substrate has enough of nutrients. As a rule the plant doesn’t require any special mineral feed. Provided with good growing conditions, when the plant grows fast, but it has a lot of rivals, it may come short of ferrum and kalium. When the plant is short of ferrum, its leaves get yellow and its new leaves grow deformed. When there is lack of kalium in the tank water, holes appear in the leaves, especially in the old ones. We should mention the rules of Amazon sword planting. The thing is, that in nursery garden the plants are grown in so called dry form, i.e. in their emersed form, which is more cost effective. Amazon sword easily transforms into its submerged form, however you should follow some rules, which will ease the adaptation process for the plant. First, you should trim the plant roots with scissors approximately up to 2 cm long, they will rot off anyway and the new ones will develop in the substrate. Don’t plant it too deep. You will see a white zone at the bush base and it has to be buried, while the green part of the bush should be left above the substrate. When the plant starts growing and new leaves appear, you can remove the old ones. Once one new leave develops completely, cut off 1-2 old ones. Continue doing so till you gradually remove all the old leaves, since Amazon sword will shed them off anyway. But if you cut them all off at once, it will severely weaken the plant. So, these are all simple rules you need to follow. In a tank Amazon sword uses almost only vegetative reproduction. Under water the plant shoots flower-bearing stems with runners and lots of new young plants grow on them. After their leaves form a rosette and their root system appears, you can separate them and plant on a new place.